In a blender, put 1/4 cup of Ambrosia Apples, 1/4 cup of walnuts, lemon juice, honey, mustard, water, sea salt and pepper. Blend well. 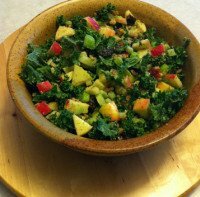 Tear kale into small pieces into a large bowl. Add rest of the Ambrosia Apples, rest of the walnuts, raisins and celery. Toss thoroughly. Pour the dressing over the kale mixture. Adjust the amount you use depending on your taste preference.